Today's brutal crackdown on the Catalan separatist movement by the Spanish government is a turning point in an ongoing confrontation that threatens to destabilise Spanish democracy and bring darker forces from Spain’s history back onto the stage, writes Matt Carr. The ‘nationalism of small nations’ inevitably draws its emotional power from a sense of victimhood and a history of oppression — whether real or imagined. Watching the confiscations of ballot papers in Catalonia over the last week, I was reminded of the raid carried out by 300 Spanish Army officers on the Barcelona offices of the Catalan satirical magazine Cu-Cut! on 23 November 1905. Outraged by a satirical cartoon lampooning the Spanish military, the officers trashed the magazine’s offices. The Spanish government, under pressure from the upper echelons of the army, banned the magazine for five months, then passed the Ley de Jurisdicciones (“Law of Jurisdictions”), which forbade any criticism of ‘Spain and its symbols’. Some Catalan nationalists will remember that episode. Others will remember the ‘Reapers War’ of 1640-52, or the Nueva Planta decrees imposed on Catalonia by the Bourbon monarchy following the War of the Spanish Succession and the 1713-14 siege of Barcelona, which deprived Catalonia of the medieval charters and privileges it had enjoyed under the Crown of Aragon, and which set out to extinguish any trace of Catalanism — including the Catalan language itself. Some may recall the martyred general Josep Moragues i Mas, drawn and quartered in the streets of Barcelona by the Bourbons in 1715. The nationalist memory is long, and it tends to focus on those episodes that bear out its narrative of oppression and victimhood. Now the conservative government of Mariano Rajoy has added a new item to the list. Because, whatever happens over the coming weeks and months, the first of October is likely to go down as a dark day in Spanish history; and a turning point in the long and often turbulent relationship between Spain and Catalonia. Even for those, such as myself, who harbour very mixed feelings about Catalan independence, it is impossible to contemplate the grotesque spectacle of masked riot police using batons, gas and rubber bullets to prevent the peaceful exercise of a popular vote, without feeling revulsion and anger. 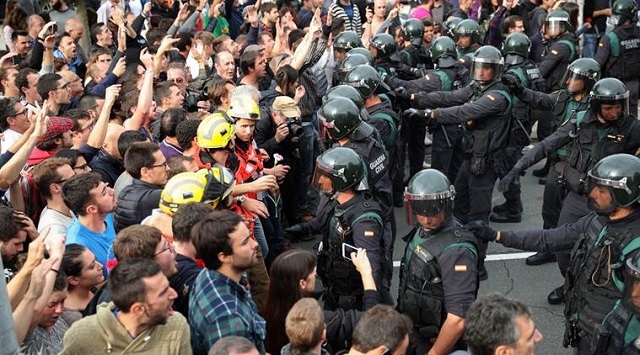 The legalistic arguments put forward by the Rajoy administration cannot disguise or justify what is, in effect, a raw display of brute force by the Spanish state; one that bodes ill for the future of Spanish democracy, having wiped away the memory of more than three decades of peaceful (and largely positive and mutually beneficial) interactions between Catalonia and Spain. Every argument that the Catalans have ever put forward for wanting to leave Spain has been borne out by what has happened today, and by the weeks of bullying, authoritarian bluster that preceded it. Rajoy’s brutally heavy-handed response may please his political base — and those Spaniards who regard Catalans as nothing more than ungrateful and petulant children — but it will do nothing to subdue the extraordinary popular movement that has been constructed over the last decade or so. Rubber bullets, batons and tear gas cannot defeat people who are prepared to camp out in schools to defend the right to vote. On the contrary, such methods are more likely to reinforce their determination to continue and escalate their campaign. Indeed, they are also likely to win over the many Catalans who do not support independence. While most polls have consistently shown a majority of Catalans want the right to vote on independence, the prospect of a a majority in favour of living in an independent state has yet to be put to the test, and the absence of any form of conclusive consultation so far makes it impossible to demonstrate. 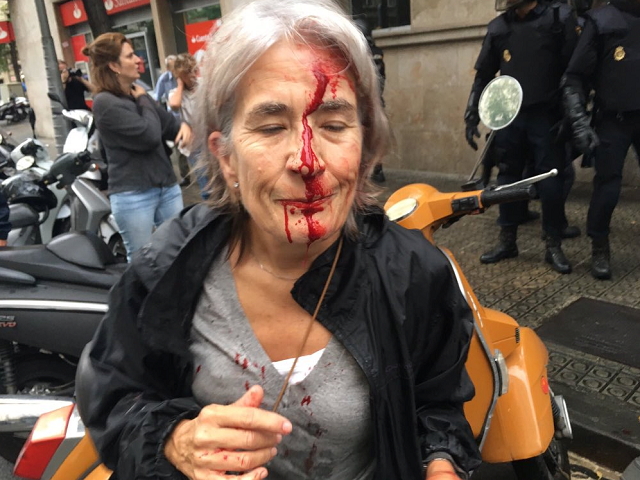 Nevertheless, by refusing to allow even a consultative referendum — all the while exalting the sanctity of the constitution above all other considerations — the Rajoy administration has made it impossible to defuse the ongoing confrontation politically. Various long-term factors have contributed to this outcome: the inflexibility of the conservative Partido Popular government with regards to prospective constitutional changes that would have widened Catalonia’s already extensive autonomous powers; the stunning corruption and mismanagement that preceded the 2009 economic crisis and which reached up to the highest levels of the Spanish state (not to mention the Catalan regional government), and the grim and socially-destructive policy of ‘austerity’ which has wreaked such havoc across the continent. In the short term, Rajoy’s government may have succeeded in disrupting the referendum. Whatever happens at the end of today, and whatever results are proclaimed by the referendum organisers tomorrow, a ballot carried out in these conditions cannot provide a mandate for independence, and it is unlikely to be accepted as such by the European Union or by any other state. This is likely to be a Pyrrhic, hollow victory however, because the numbers of votes are far less significant politically than the searing images of baton charges, bleeding demonstrators, and women, children and old men dragged away from polling stations that we have seen today. Such scenes will not easily be forgotten, either by the outside world or by the Catalans themselves. Because Catalans have a long history of rebellion and resistance, as well as victimhood, to draw upon, and today’s events will provide them with renewed inspiration. So 1/10 is likely to be followed by further escalation. Beyond that, nothing is certain. Assuming the separatist coalition holds together, it will have to decide what to do next. If it proclaims victory and declares unilateral independence, it remains to be seen whether it can carry the majority of the Catalan population with it — for example by declaring a general strike or engaging in other forms of civil disobedience. If it tries to do any of this, its leaders will be arrested, Catalonia’s finances are likely to be sequestered, and the Catalan government may have its powers removed. But for the Spanish government to impose such measures will ultimately require a state of emergency, enforced by the military as well as the police. Should that happen, one of the key members of the European Union will effectively be deploying an army of occupation while still presenting itself as a democratic state. This would be a disaster for the Catalans, for Spanish democracy, and for Europe. Unlike the Basques, the Catalans have so far campaigned peacefully. But there are political forces within Spanish society and the Spanish state that are implacably imposed to separatism, regardless of the methods it uses. The Spanish armed forces have long upheld the unity of the Spanish state as part of their central mission. It is often forgotten that the military coup of 1936 was motivated as much by opposition to the ‘centrifugal forces’ that threatened the unity of the Spanish state as it was by reactionary opposition to anarchism, the left and the social reforms of the Republican government. There will not be many officers in the Spanish army prepared to accept the secession of the richest region of Spain — a rupture that would almost certainly be followed by a resurgence of demands for independence from the Basque Country and from other autonomous regions as well. At the worst case then, there is the possibility that Catalonia may become another Bosnia and that bombs may once again return to Barcelona. That is a catastrophe that every democratic Spaniard should do everything to avoid — and which the outside world should urgently seek to prevent. This does not mean that Catalan self-determination is impossible or should be rejected on principle, simply because of what the Spanish army wants. Ultimately it should be up to Catalonia to determine its own political future, just as Scotland did in 2015, and may yet do again. Two days ago the Catalan president Carles Puigdemont and his minister for external affairs Raul Romeva hinted there might be scope for negotiations with the Spanish government over other options beyond independence. This should not be surprising. Puigdemont is a conservative politician, not a revolutionary. He has asked the European Commission to act as an intermediary — an invitation that has so far not been accepted. It remains to be seen whether that position remains on the table after today’s events, and whether the European Union – or someone – can show some energy and real leadership in helping to bring an end to this crisis. Because there are real dangers here that should be recognised. If they aren’t, and if a democratic solution cannot be found, this confrontation may yet go down a far darker path than we have seen so far, and few people — whether Spaniards or Catalans — will benefit from it.